New 2018!!! 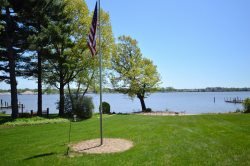 If you love the lake life then this home is for you! Summers Edge sits right on Lake Macatawa. This home is walking distance to Howard Dutton Park and playground and there is a boat launch just down the road! You are walking distance to "Captain Sundaes" ice cream, mini golf, restaurants and DeBoer Bakery (cinnamon rolls are a must!). This recently updated home features 3 bedrooms and 2 full bathrooms on the main level and the walk out basement has 1 full bathroom and a family room with 3 sets of bunk beds for additional sleeping options. There is also a game room located in the lower level complete with a game table so practice your poker face before arriving at this home! The deck is huge and offers both sun and shade options. The yard leading down to the lake is grassy and ideal for yard games with the family. There is also a fire pit down at the patio on the lake. Holland is located on the shores of Lake Michigan and Lake Macatawa. Here, you can spend your days at Holland State Park where there is plenty of room for family fun along the white, sandy beaches. You and your family can take an excursion to Nelis' Dutch Village, DeKlomp Wooden Shoe Factory, and Veldheer Tulip Gardens. These places will bring you back in time to experience the Netherlands of the 1800's. If you find yourself in Holland the first week of May, be sure to take a look at the over 6 million tulips blooming throughout the city during Tulip Time festival, which was named the "Best Small Town Festival in America" by Reader's Digest Magazine and received USA Today's "2016 Best Flower Festival!" Downtown Holland is known as the "Great American Mainstreet." Make sure to spend a day downtown where an abundance of shopping and dining can be found, as well the funky street performers who will surely entertain you with their acrobatics, magic, music and more! From the award-winning downtown to the exceptional beaches and Dutch heritage, your family will fall in love with Holland's small town charm and big city amenities.